Discover McNabs Island is a collection of writings, photos and maps about McNabs Island and to a lesser extent, Lawlor and Devils Islands. Readers will find that Discover McNabs Island is more than just a guidebook. It is a history book and nature book wrapped under one cover. Originally published in 1995, the second edition of Discover McNabs Island includes updated chapters, new photos and a new chapter on the islands geology that shows how the island is ever changing. McNabs Island located at the entrance to Halifax Harbour offers a glimpse into Nova Scotia's colourful past and rich natural beauty. McNabs, along with nearby Lawlor, is now protected as a provincial park. A short ferry ride brings you to McNabs Island where you can discover 19th century Fort Ives and Fort McNab National Historic Site, abandoned Victorian gardens, beautiful sandy beaches, sheltered coves and panoramic views. Discover McNabs Island is self-published by the Friends of McNabs Island Society. The 116-page book is printed on 100% recycled paper by Halcraft Printing Inc. of Halifax and retails for $19.95. The book is available in local book and gift shops or directly from the Friends of McNabs Island Society. For more information visit www.mcnabsisland.ca. Discover McNabs Island is yours to discover! 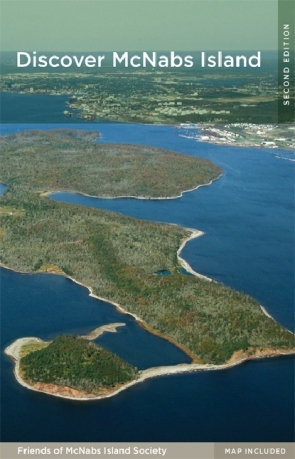 Also available from the Friends of McNabs is a large colour aerial photo-poster of Halifax Harbour and McNabs and Lawlor Islands Provincial Park. Retail cost, a bargain at $5.00. The perfect gift for Maritimers at home and away!